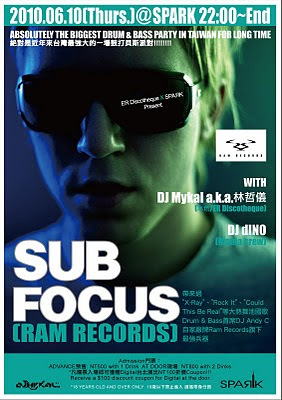 本名Nick Douwma的Sub Focus,無庸置疑在英國D&B,Electronic圈已是炙手可熱的新星，2003年得到Ram Records/Frequency廠牌老闆、也是英國公認的No.1 D&B DJ "Andy C"賞識致電力邀納入旗下! 隨即在副廠牌Frequency發表首張單曲"Down The Drain"獲得熱烈迴響,成功打入英國D&B圈! 2004年，在單曲"Strobe"收錄於主廠Ram Record發行的EP "Ram Raiders 6"之後，隔年終於在主廠Ram Records發表首張12吋單曲黑膠"X Ray"，此張單曲被形容為「當Zombie Nation遇上西雅圖車庫搖滾」並受大家親睞於當時電台主打，一天甚至會播上好幾遍；該曲除了獲選 Zane Lowe’s Radio 1 show當週最佳單曲之外，之後更被封為2005年最夯的D&B國歌之ㄧ(同時也登上UK跳舞榜冠軍)! 終於，在一連串Remix發行與先行單曲"Rock It / Follow The Light"電台放送試聽之後，首張個人同名專輯「Sub Focus」於09年12月發表! 隨即獲IDJ雜誌選為當月最佳專極並給予滿分評價並摘下09年英國D&B權威社群網站 D&B ARENA大獎的「最佳專輯獎」!!! 或許你對D&B Culture不甚了解，或許你也錯過了上次Andy C在Partyroom的演出，但這次，6/10 Sub Focus @ Spark，你絕對可以感受最棒的UK D&B ! ▓原是台北地下舞場spin的舞客,99年受DJ Mykal a.k.a.林哲儀賞識,網羅在Spin旗下駐場, 2004年與DJ Mykal、DJ Spykee合組more!企劃團隊,於台北PARTYROOM擔任駐場DJ與活動企劃. 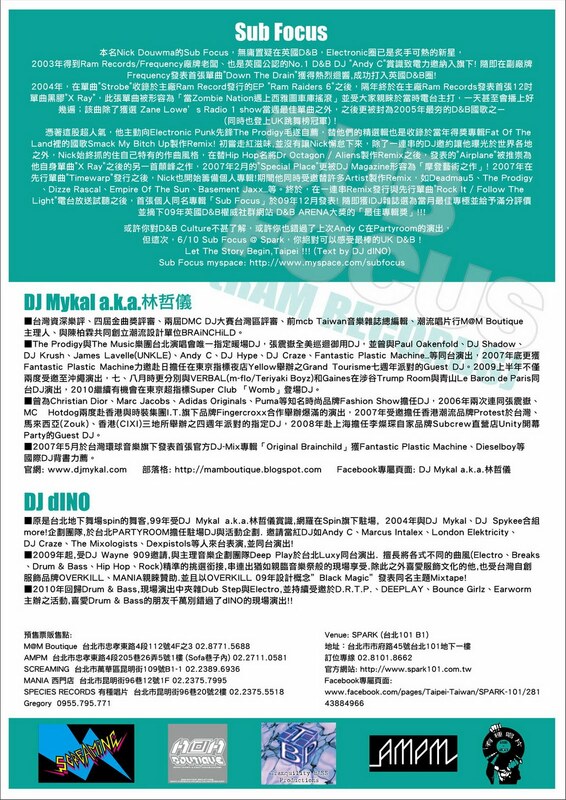 邀請當紅DJ如Andy C、Marcus Intalex、London Elektricity、DJ Craze、The Mixologists、Dexpistols等人來台表演,並同台演出! 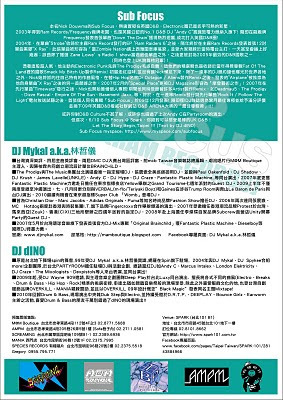 ▓2009年起,受DJ Wayne 909邀請,與主理音樂企劃團隊Deep Play於台北Luxy同台演出. 擅長將各式不同的曲風(Electro、Breaks、Drum & Bass、Hip Hop、Rock)精準的挑選銜接,串連出猶如親臨音樂祭般的現場享受.除此之外喜愛服飾文化的他,也受台灣自創服飾品牌OVERKILL、MANIA親睞贊助.並且以OVERKILL 09年設計概念”Black Magic”發表同名主題Mixtape! 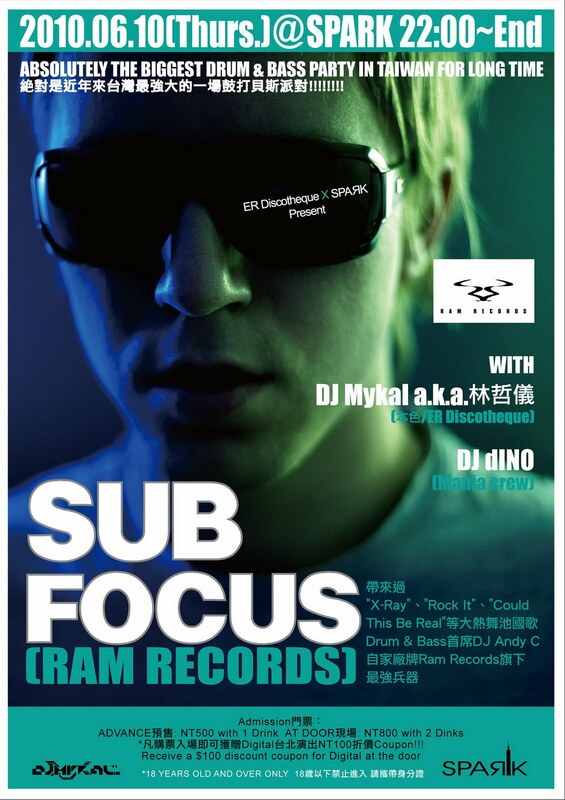 ▓2010年回歸Drum & Bass,現場演出中夾雜Dub Step與Electro,並持續受邀於D.R.T.P.、DEEPLAY、Bounce Girlz、Earworm主辦之活動,喜愛Drum & Bass的朋友千萬別錯過了dINO的現場演出! !